When you're looking to wind down in your own private waterfront oasis with a stunning view, this is that home. 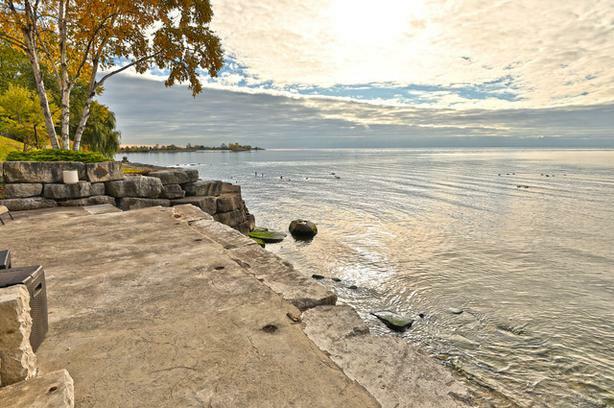 Situated in Toronto's historic Long Branch district between, Brown's Line and Kipling Avenue, this eclectic home is directly on the shores of Lake Ontario. Offering Riparian Rights to the water, and a terraced sea wall that creates additional outdoor living space, this is the perfect home for entertaining or relaxing. Inside you'll discover an open-concept main level with floor to ceiling windows and rooms awashed in light on both the main and second floor offering multiple views to the water. The master suite has a door that leads directly to a generous sized deck overlooking a lake view. Fitness enthusiasts and nature lovers alike can enjoy the nearby bike paths, while no less than 5 parks are within walking distance, making it a perfect home for someone to enjoy the outdoors. If you're a boater, this property has that covered, as the Lakeshore Yacht Club is located in the nearby Colonel Samuel Smith Park. When you need to get somewhere fast, Mississauga and Toronto transit stops are less than 10 minutes from your doorstep. Have plans downtown for the evening? The Long Branch Go Station is a 15 minute walk away making access to downtown Toronto easy. Why not come for a tour.